Imagine Yourself Locked In An Epic Battle With A Marlin 'The World's Fastest Fish' – It's The Stuff Of A Hemingway Novel … And You're Just Two Clicks Away! 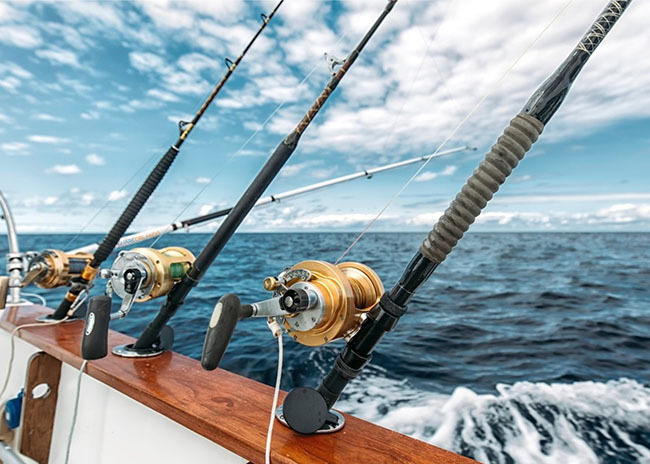 Read on to discover how you can easily enjoy the most memorable Deep Sea Fishing experience of a Lifetime – one that will make your fishing buddies green with envy …. 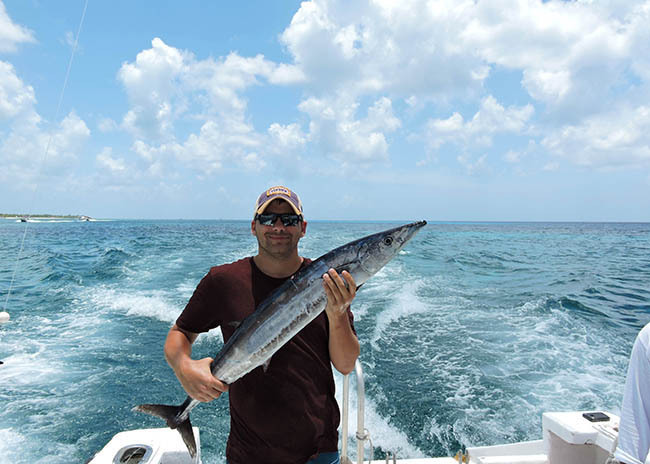 Dear Fellow Fishing Enthusiast … few experiences in life can measure up to the sheer excitement of deep sea fishing in the stunning Caribbean Sea, a few miles off the beautiful island of Cozumel. 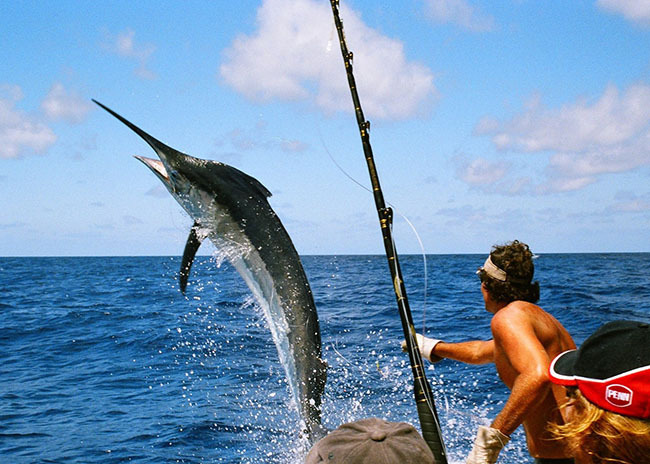 That’s because the very best big game fish in the world, such as: wahoo, mahi-mahi (dorados), barracuda, groupers, amberjack, kingfish, snapper, marlin, triggerfish, sailfish – and even the yellowfin tuna - are to be had in our rich deep sea fishing grounds! 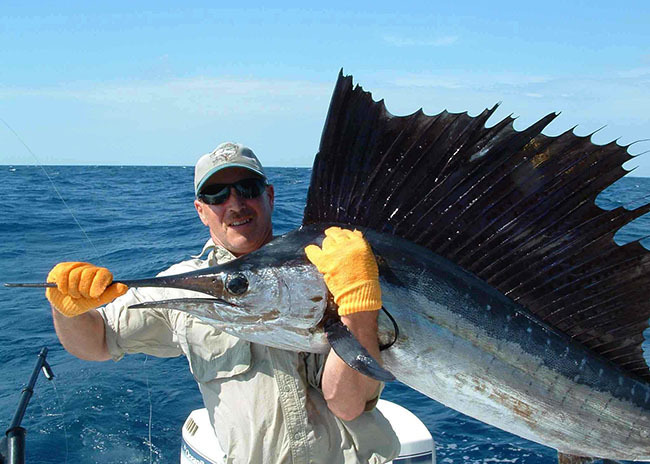 So magnificent is the deep sea fishing to be had off Cozumel that some fishing charters travel as much as 40 miles or more to fish in our wonderful waters. But, as a valued guest of ours, you won’t waste a precious minute before you engage in battle – because we’re just ten minutes or so cruising time from your fishing adventure of a lifetime! So just imagine the tales you’ll be able to tell your fishing buddies back home (and the photos you’ll be able to show) and the high esteem they will hold you in as a result. Hola … my name is Alberto Novelo and I and my close family have been successfully providing deep sea fishing charters from Cozumel for 38 years (since 1980). So, when you take our tour, you’ll know you’re dealing with a family owned and staffed business, because we will look after you far more attentively than a business staffed by just employees. First time Deep Sea Fishing in the Caribbean and it was a total blast!" This was my first time deep sea fishing. I tagged along with my brother in law and really didn't know what to expect. These guys really know what they are doing and we caught a total of eight fish including tuna, barracuda and mahi-mahi. The guys on the boat worked hard and made sure we were happy, providing us with drinks and fishing tips when we were reeling in the big fish! We ended our trip with the guys cleaning and bagging our catch, and onward to the Money bar where they cooked our fish to our desired taste. Our bellies were full and we were very happy that day! We gave thanks to the ocean, the island and the guys who worked so hard that day! We will for sure come back to Cozumel and do this again. All the boat captains and first mates (mostly my uncles and cousins) all speak excellent English, so your memorable day won’t be spoilt by having to struggle to understand what they are saying. In fact, that is one risk you really cannot afford to take. Because – in situations like this – whether fishing or snorkeling - safety has to be top priority. So it’s vital you understand every word the instant your crew says it, without a second’s doubt or hesitation. All our captains and first mates have 25 and 15 years experience respectively of deep sea fishing in these waters, so you can be sure they know and will use every trick in the pack to make sure you catch plenty of fish. 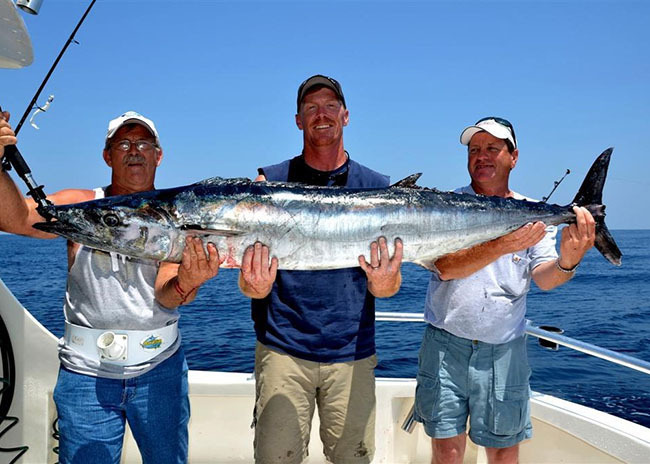 Over the years we have thrilled many thousands of fisher folk with the sheer excitement of deep sea fishing that we provide and many become firm friends and return again and again to fish our Caribbean fishing grounds. 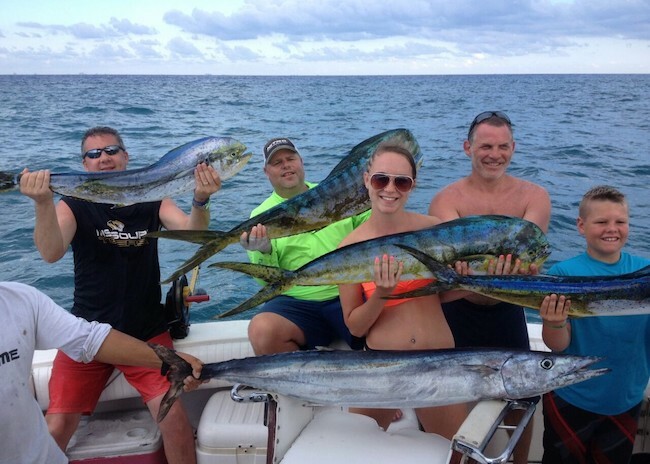 I know you will have a great time - this is the third time I've fished with these guys"
I just returned from a Cruise trip to Cozumel. We fished with Capt. Alberto. We chartered one of his boats, Miss Allison II. We had an excellent time. We fished for the whole day and we ended up catching six mahi mahis, two wahoos, and three medium sized tunas. If you ever get a chance to go to Cozumel, you should definitely contact Cozumel Fishing. I know you will have a great time. This was the third year in a row I have fished with these guys! You’ll be using the world’s best deep sea fishing tackle from Shimano and Penn. Alternatively, you can bring your own, if you prefer. 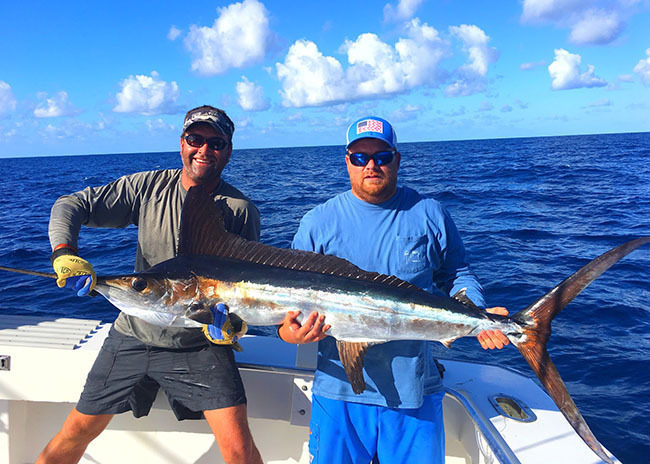 So - whether you’re a deep sea fishing rookie or a veteran - you’ll be giving yourself a distinct unfair advantage by fishing with the guys who will leave no stone unturned to guarantee you enjoy a spectacular day. The crew got very excited and did everything possible to make sure the fish got in the boat"
First, let me just say this is a very respectable and professional company. We did this excursion on a Carnival Cruise and I was a little concerned not using the cruise ship, but we had no problems whatsoever. It was a quick half mile ride from Cruise Port in a Taxi. We met up with our crew and took off right away. The crew offered us water, beer, and soda. We rented the 38ft Hatteras Boat for a 4 hours Fishing Trip. It was nice knowing there was a bathroom on it if we needed it. They only took about 15 minutes before we started catching fish. We did catch a couple nice ones and it wasn't long before we hooked a mahi mahi. Each time we hooked a fish (about five or six mahi mahi and one tuna), the crew got very excited and did everything possible to make sure the fish got in the boat. It was a lot of fun and really nice to have your own private boat for a few hours! I would definitely recommend this excursion to anyone who is looking for a deep sea adventure! At the end of the trip, they called us a taxi and we were back to the cruise ship in no time. Children aged 1 and upwards are most welcome on board, provided they are supervised at all time by an adult member of your party. And, if they are 3 years or older, they can enjoy probably their first taste of deep sea fishing, because we have special light fishing gear for their use. They can also enjoy snorkeling, if that is your wish. We both had another fantastic trip!" 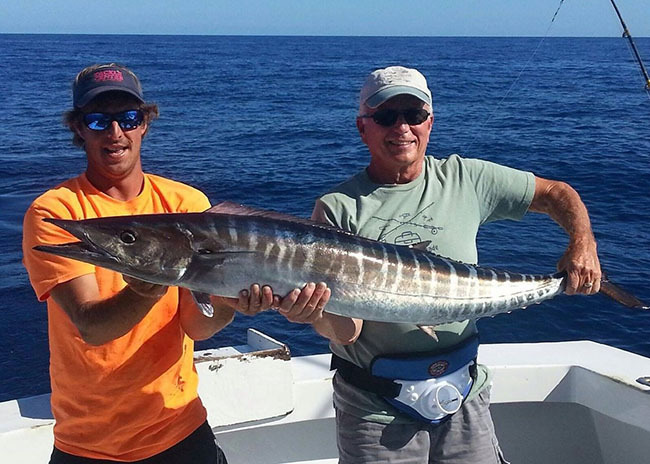 My friend John and I came down two weeks ago and got into some really good wahoo fishing on the Miss Allison II. I have been fishing with Cozumel Deep Sea Fishing and Captain Alberto before, but this was the first time John, who is from England, got to go with me. We had eleven bites that day from wahoos and mahi mahis and caught eight of them: five wahoos and three mahi mahis. We lost a tuna near the boat too, around lunchtime. It was about 45 lbs. In the afternoon we trolled offshore for a while but had no more luck. The weather was great and we both had another fantastic trip! Unlike most other deep fishing businesses we go the extra mile for you and always supply FRESH bait – rather than mere lures - to ensure the chances of you enjoying a spectacular catch are greatly increased. And again – unlike most of the other deep sea fishing businesses on Cozumel, we go the extra mile for you by filleting and cleaning your catch, which you can then take back to cook for your supper – or have it cooked for you at one of the local restaurants where we have made special arrangements for you. That’s just two of many reasons why you’ll enjoy an exceptional deep sea fishing experience few other tours will match. So whichever boat of our tiny 3 boat fleet you fish from – you can be assured your fluent English speaking Captain and his First mate have 25 and 15 years experience respectively fishing in these waters and so know exactly where to take you to catch the very best fish, ensuring you enjoy an amazing adventure that you’ll remember for the rest of your life! 4 hours - For those Travelers that want to squeeze a quick Fishing trip among other activity they have planned to do while visiting the Island. Also the preferred option amongst Cruisers. 6 hours - Our Most Popular option amongst Families with Kids that want to combine Fishing and Snorkeling in the same Trip. 8 hours - The right choice for those serious Anglers that want to maximize their chances of catching big fish. Fishing & Snorkeling Combo - The favorite Combo for Families with Kids that want to experience the best of both Worlds: Fishing & Snorkeling. (Available ONLY on 6hrs, and 8hrs lengths). 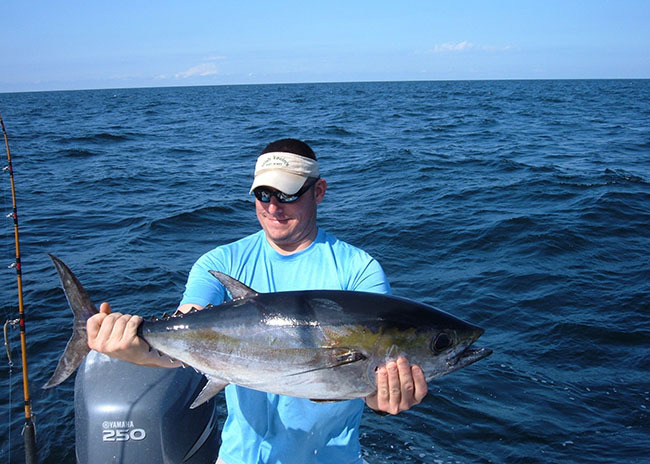 While deep sea fishing can be exhilarating, it isn’t to everyone’s taste and bottom fishing does come with an increased chance of catching amberjack, mackerel, barracuda, grouper, kingfish, triggerfish and snapper. The crew got very excited and did everything possible the fish got in the boat"
Our family of four (two teenage boys) have had four or five experiences in ocean fishing, and enjoy holding the rod to feel the bites, rather than trolling and taking the rod only after the fish have struck. So we requested bottom fishing. We arranged a boat for six hours with Cozumel Deep Sea Fishing Charters, and met Captain Alberto at Marina Caleta, a private marina south of the Carnival Cruise Piers. The captain had been informed of our preference in advance, and was very intent to ensure we enjoyed our experience. We moved around four or five times at different reefs, and at each spot caught four or five fish. We caught two fairly large red snapper, one grouper and about 15 other fish. Everyone in the family had the thrill of feeling the bites and reeling in the fish. At the end, we took the six largest fish and had them cooked in the Money Bar Restaurant by the marina (US$8 per person): the snappers and grouper were fried (tasty, but next time we'll ask for grilled) and the smaller fish prepared as ceviche - delicious! We couldn't have been more satisfied with the entire experience! 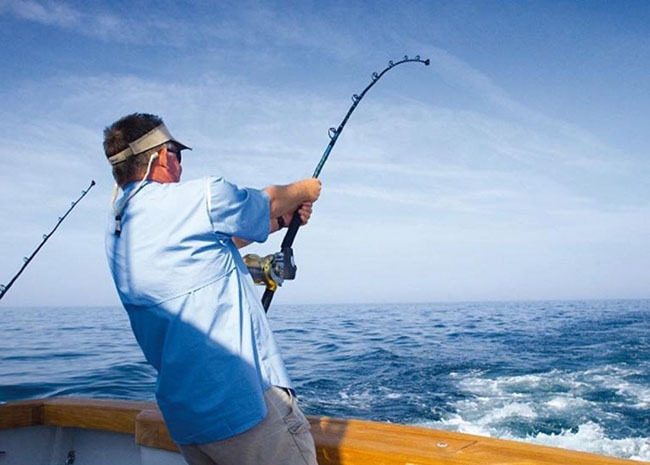 This offers you the very best of both worlds – the thrill and suspense of Deep Sea Fishing with an almost 100% chance of a good catch by Bottom Fishing. That's the reason why our Sport Fishing Boats are equipped with both Outriggers for trolling, and Downriggers for Bottom Fishing with Weighted lines by the Reefs. Amazing! They cleaned and bagged the fish, and we took the bags to a local restaurant to have some great meal prepared!" We had an incredible day, even though it was average for them. We brought five large Dorados to the boat, and saw a ton of other ones that just would not bite. But, the Captain and his Mate worked HARD at various ways to catch some fish. At the end of the day, we bottom-fished for about 45 minutes, and caught about 50 pounds of red snapper, grouper, and triggerfish. AMAZING! They cleaned and bagged the fish, and we took the bags to a local restaurant to have some great meals prepared! 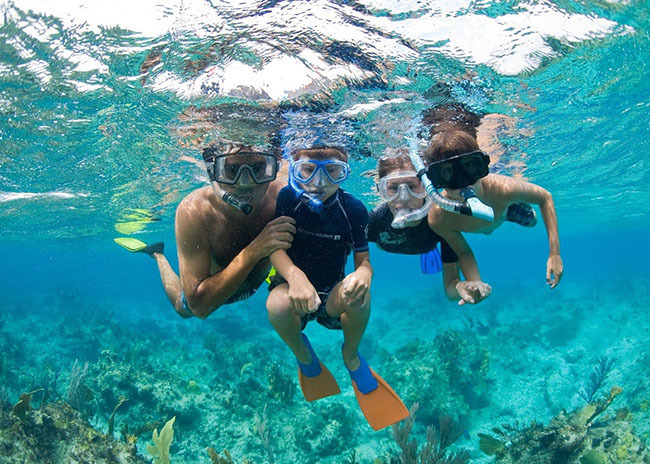 If you want to add the thrill of snorkeling in the beautiful protected Cozumel Marine Park, with reefs that are second only to the Great Barrier Reef in Australia, then book either the 6 or 8 hour trip. You’ll be served lunch on the 8 hour trip! And, if you’ve never snorkeled before, you’ll be given detailed instruction by our experienced crew who are also highly experienced in snorkeling. And you’ll enjoy a spectacular dive few other companies can match because my company fulfills the very strict ecological demands by operating ultra eco-friendly boats and are therefore licensed to enter the restricted, marine life rich, protected area forming Cozumel’s spectacular underwater wonderland – The Cozumel Marine Park. Our family, with two children four and seven years, went on a six hour fishing & Snorkeling trip with Fernando (Captain Alberto’s son). We ended up with a mixed bag of a barracuda, mahi mahi, wahoo, spanish mackerel, and a tuna. This was very good for us as it was our first time deep sea fishing. The snorkeling, two 40 minute sessions at two different reefs, was incredible. We saw a huge eagle ray, turtle, and barracudas. Fishing and then seeing what is underwater near where we were fishing was a blast! We were able to stop at the Money Bar and they cooked our catch. All snorkeling gear (when the Fishing & Snorkeling option is selected). Fishing Licence is included too. Your choice of start times: on the hour from 6:00am until 2:00pm. We If you are arriving on a cruise ship, then allow 30 minutes from docking to cover any delay in embarkation. Coming in on a Cruise Ship? Then you'll arrive at the Cruise Pier. This is just 500 yards (0.5 kilometres) from where we meet at the 'Marina Caleta'. There will be plenty of taxis at the Cruise Pier, so jump in one, give the guy 8 bucks and you'll be with us in 3 minutes! And there are always plenty of taxis at the 'Marina Caleta' to get you back to your ship in good time. If you are staying in Cozumel: Then you'll arrive at anyone will be able to give you directions, particularly the staff where you're staying. And every taxi driver knows where the 'Marina Caleta' is. And taxis are always available at the marina for your return journey. Coming from Playa del Carmen or elsewhere on the mainland? Then you'll arrive on Cozumel at the Ferry Pier. From there it's just 3 miles to 'Marina Caleta', straight via Cozumel´s Oceanfront Boulevard. It's probably too far to walk, although I'm sure the folks at the ferry pier will be happy to point you in the right direction, if you choose to do that. Alternatively, you can get a taxi, which will get you to 'Marina Caleta' in about 5 minutes. And there are plenty of taxis to take you back to the Ferry Pier after the fishing trip. We had a great day and can't wait to get back for more!" My family had a great day fishing with Captain Alberto. The boats are very conveniently located near the cruise arrival pier and really comfortable. The captain and mate were really accommodating and fished hard. We had a great day and can't wait to get back for more. Cozumel Deep Sea Fishing is highly recommended for a great trip. Thanks guys! And if you are one of the 80% of our VIP clients who come off a cruise ship, you’ll find our meeting place just 500 yards along the shore from the Cruise Pier at the Marina Caleta. And, if you are coming by ferry from Playa del Carmen, our meeting point at the Marina Caleta is just over a mile away along the shoreline. You’ll find taxis right outside the ferry arrival point that will quickly transport you to our meeting point. And, if you are staying in a hotel on Cozumel, you’ll received ample directions with the emailed confirmation of your booking. And every taxi driver knows where the Marina Caleta is. You can decide what time we set off – any time from 6. 00 am until 2 00 pm. You can also pick the length of your trip: either four, six or eight hours. If you want to combine snorkeling with fishing then choose either the six or eight hour trip. You’ll also get lunch with our compliments on the eight hour trip. Once you step aboard our beautiful 38 foot Hatteras Sport fishing boat you’ll realize this is the REAL THING. How neatly organized everything is and you’ll notice the Outriggers and Downriggers set for some serious fishing. You’ll also notice the battle-ready fighting chair and fishing belts. Then, as we fire up the powerful eco-friendly marine engine your excitement will rise to fever pitch. Then, after just ten minutes or so at sea we arrive at the fishing grounds ready to start your big adventure. When you take up your rod! So don’t forget to bring your camera, because you don’t want to miss the chance of getting those amazing photos of you standing proudly beside that giant blue marlin or sailfish you’ve just caught. 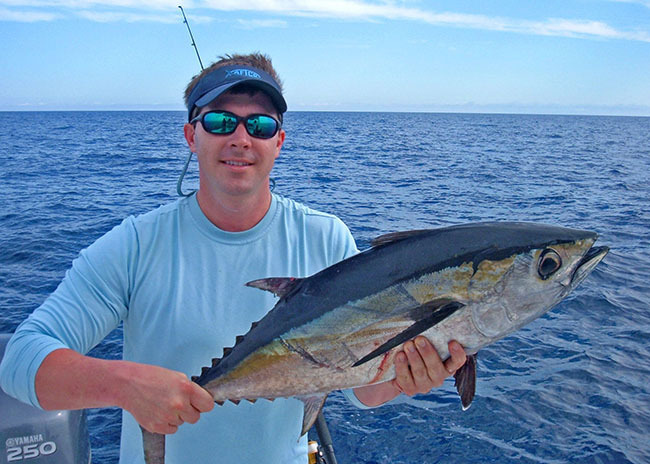 Include yellowfin tuna, blue marlin, wahoo, sailfish and mahi mahi (dorados). 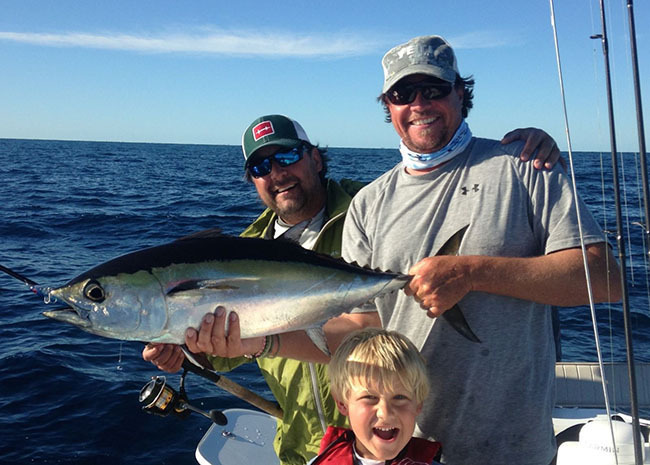 Or maybe you’ll get REALLY lucky and catch a rare blackfin tuna. And, after a few more battles with the fish, you’ll have worked up a good thirst and an appetite. So you can sit back, enjoy a sip a cool soft drink, beer or water and snack or fresh fruit with our compliments in the ample shade, whilst you admire the expert way the crew fillet your fish, ready for a splendid supper, when you get back on shore, while you excitedly swap experiences with your fellow fisher folk. An open cabin and an inside restroom for your convenience. Then it’s time to get back into the battle! Then all too soon, it’s time to head back to port. Can we really have crammed so much excitement and precious memories into just those few fun-filled hours? 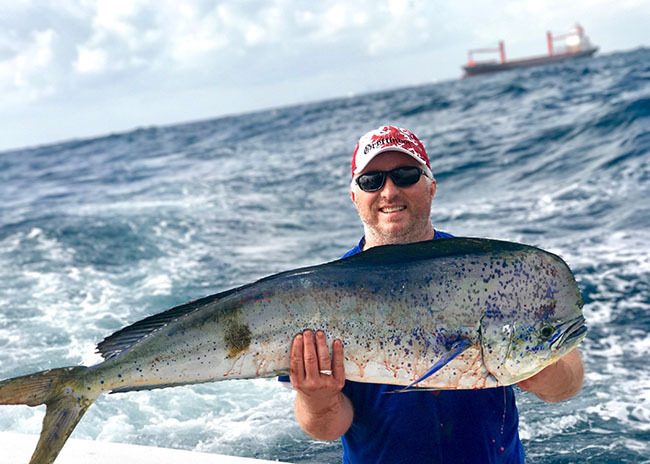 What’s more because you enjoy direct contact with us, we can plan the very best fishing trip for you (such as giving you a combination of deep sea fishing and bottom fishing). What’s more, many of the items that other operators might charge you for – such as the Snorkeling Equipment (should you choose to do a combination of Fishing and Snorkeling), the entry fee to the protected Marine Park and the beer, soft drinks and water are all included in your fee. Please note the Fishing & Snorkeling Combo trip requires either a 6 or 8 hour trip, because there’s so much to pack in. 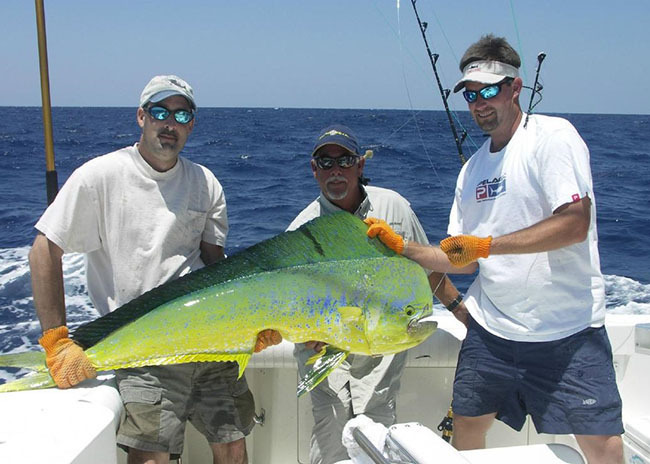 Last week 24 Travelers booked our Fishing Trip to go after Mahi & Yellowfin Tuna. Today it's your turn. As you’ve seen there are distinct advantages in dealing with a small family-owned business like ours, such as the highest possible value coupled with five star service. Because we chose quality over quantity every time, we have just 3 boats in our fleet of sport fishing boats. That’s because we can then crew them with a captain and first mate from my close family who have at least 25 and 15 years experience. And, because we are one of very few businesses combining the highest quality deep sea, bottom fishing and snorkeling experience in the same tour and most of our clients come from the cruise ships, bringing in around 20,000 cruise visitors daily, when we just have a maximum capacity of 3 Fishing trips a day - we tend to get booked up lightening fast for every day of the week, including Sundays. And you might find yourself struggling to understand the broken English spoken by the crew – which can be downright dangerous when deep sea fishing or snorkeling. And your alternative trip probably won’t include the fresh bait that we insist on using because its gives you the very best chance of some spectacular fishing. And – if you want to add the thrill of snorkeling among the most spectacular reefs then it almost certainly won’t be possible, because very few other businesses are allowed - like we are - to enter the protected area of the Cozumel Marine Park with reefs that rival the Great Barrier Reef in Australia. You can make the smart move and decide right now which day you want to become the memory of a lifetime by booking our premier Cozumel Deep Sea Fishing Trip immediately. Then, once you’ve made your booking, you can relax and look forward to that magical moment when you step onto our boat. I and all my family are eagerly looking forward to welcoming you to Cozumel and giving you a day that will be seared in your memory forever! With 20,000 visitors coming off the many cruise ships that dock at Cozumel daily, our daily seats on our popular snorkeling tour don’t stay empty for long. So – if you see the day you want still available – I suggest grabbing it. Remember the old proverb: “He who hesitates is lost”? So I strongly suggest you check the availability on your chosen day - right now – and then go ahead and book your Fishing Charter. Seven fish: one Tuna and six Mahi Mahi and a great day"
We chartered a boat for the four of us. My son and I fished, as my wife and our daughter did not want to but wanted to enjoy the ride. We had Alberto and Luis as our captain and guide. They were fantastic and made us feel welcome and comfortable. Within the first hour we had caught five fish. One yellowfin tuna and four mahi mahi. Luis was right there showing us how to reel them in and hooking them to get them out of the water to assure a good catch. We ended the day with six mahi mahi and the tuna. Well over 100 pounds of fish. We chose to give them to Captain Alberto and Luis, but had the option of taking them to have them cooked. We fished from 9am to 1pm. The price was reasonable and they provided water, sodas and Coronas. The meeting point for cruise passengers is about 500 yards along the shore from the Cruise Pier at the Marina Caleta. You can either take a gentle stroll along the shore or jump in a taxi right outside the Cruise Pier. There are also taxis at the Marina Caleta to take you back to the Cruise Pier after your trip. You will arrive at the Ferry Pier, which is just over a mile from our meeting point at the Marina Caleta. You will receive full directions with the confirmation of your booking. You’ll find taxis outside the Ferry Pier that will quickly transport you to our meeting point and there are taxis at the Marina Caleta to take you back to the Ferry Pier, after your trip. Our meeting point is at the Marina Caleta and you will receive full directions with the confirmation of your booking. Every taxi driver on Cozumel knows where the Marina Caleta is. As this is private charter for your party, you can choose the time we set off, which can be as early as 6.00 am or as late as 2.00 pm. You can also choose the duration of the trip either: four, six or eight hours. 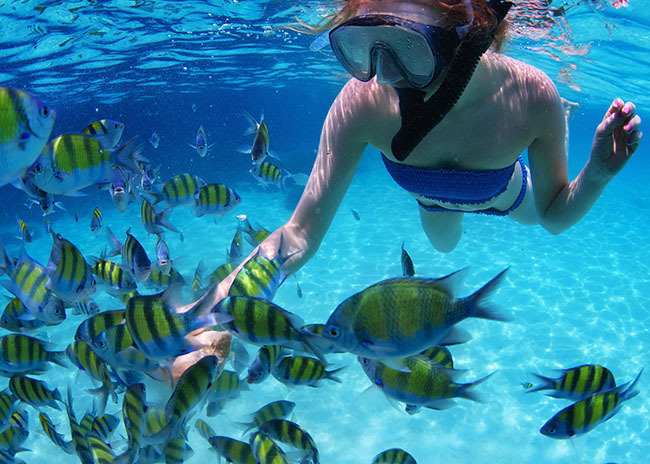 If you want to add the thrill of snorkeling to your day, then book either the six or eight hour trip. If you’re coming from a cruise ship, please book our meeting for 30 minutes after the ship is scheduled to dock to allow for embarkation delays. And, if you’re coming by ferry from Playa del Carmen, arrange to meet us ONE HOUR AFTER your ferry is scheduled to depart from Playa del Carmen. Can you please confirm the pricing structure again? Our charges are based on a party of six passengers aged 13 and upwards. The four hour trip is just $395USD; the six hour trip is $445USD and the eight hour trip is just $495USD. Passengers beyond six are $50USD extra to a maximum of 12. All three of our top quality sport fishing boats can take up to 12 passengers. But please note that can change in a heartbeat. So – if you see a slot you want – book it right away. Because, with 80% of our bookings coming from the 20,000 daily cruise visitors, available slots tend to get booked up lightening fast. As you are coming by cruise ship, please remember there will be plenty of other folks all trying to disembark at the same time as you. So – even though our meeting point is only 500 yards from the Cruise Pier - pick a departure time at least 30 MINUTES AFTER you are scheduled to dock to allow for the inevitable delays in embarkation. You will need to catch a ferry at least ONE HOUR BEFORE you have arranged to meet us. Bear in mind our meeting point is just over a mile from the Ferry Pier, which is where you will arrive on Cozumel. You will receive full directions with your emailed booking confirmation and taxis are available right outside the Ferry Pier for the short trip to the Marina Caleta. NO. Unlike other fishing trip companies, the cost of your Federal Fishing License, the fresh bait plus the cleaning and filleting of your catch are all included, as are the cost of your brand new one time use snorkel tube plus the Marine Park entry fee, if snorkeling. We also provide soft drinks, beer or water, snacks and fruit and lunch on the eight hour trip with our compliments, free of extra charge. NO. This is one expense you will have to carry, because it would not be fair to the roughly 80% of our clients who only have a 500 yard walk to our meeting point if we were to add the cost of your ferry trip to our prices. NO. This is one expense you will have to carry, because it would not be fair to the roughly 80% of our clients who only have a 500 yard walk to our meeting point if we were to add the cost of your taxi fare to our prices.